In his remarks to the Minnesota Environmental Quality Board's Environmental Congress on Friday, Gov. Mark Dayton said the proposed Twin Metals Minnesota copper-nickel mine near Ely might be the exception to his rule that strong economic development and environmental protection are complementary. The governor acknowledged the project would create more than a thousand construction jobs, and hundreds of direct jobs if the mine opened. But he said those jobs would come at a serious risk to the environmental integrity of the Boundary Waters Canoe Area Wilderness. "I believe that we don't have the right to endanger the BWCA's essential integrity as a pristine natural preserve, for any price, even important jobs," he said to applause. 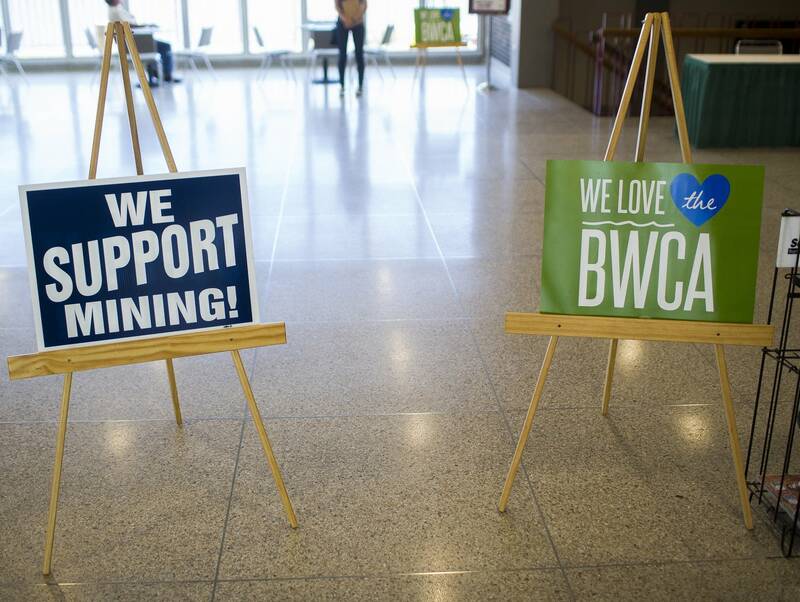 The debate over potential copper mining within a few miles of one of the country's most popular wilderness areas has heated up again this week. U.S. Rep. Rick Nolan, a Democrat who represents northeastern Minnesota, called on the Trump administration to overturn a recent federal decision that called for a potential 20-year ban on mining on national forest land within the watershed of the Boundary Waters Canoe Area Wilderness — including where Twin Metals is exploring. That prompted a sharp rebuke from fellow Democratic Rep. Betty McCollum, who represents the east metro, along with a group of protesters who rallied outside Nolan's office in Duluth Thursday. Dayton acknowledged his stance against Twin Metals has been severely criticized by Nolan and others who say modern copper mines can be operated safely, and also bring badly needed jobs to a region of the state still recovering from a recent downturn in the iron ore mining sector. Mining supporters also argue Twin Metals should be allowed to submit a mine plan, which would then be vetted by an environmental review process to determine whether a mine can meet pollution standards. That's the process currently underway with the nearby PolyMet mine, proposed about 20 miles to the south of Twin Metals, outside the BWCA watershed. PolyMet went through more than ten years of environmental review, before state officials ultimately signed off on the final study last March. State and federal agencies are currently reviewing PolyMet's permit applications. "The inadequacies in our state's environmental review laws and procedures make it very difficult to say 'no' at the end of such a long review," Dayton said. And once an environmental review is accepted, he added, "the expectation is that permit approvals will follow." The governor concluded by saying he would invoke this kind of "preventative rejection" of a project only rarely. But he said "protecting the waters of the BWCA is one of our generation's sacred responsibilities."